Speaking to small associations for free is one of the best ways to grow your coaching business. Are you using this strategy? Would you be interested in learning how to sell an average of $7,500 of your coaching services per talk to small audiences of about 30 people? Join me for a special free teleseminar this week where my dear friend and former business partner, Michael Charest, will show you how! Michael is the go-to-guy if you want to learn the art and science of enrolling lots of new coaching clients from speaking. So I’m thrilled that he agreed to provide this info-packed training to the Coach & Grow R.I.C.H. community this Thursday June 21at 4pm Eastern. => How to find over 20,000 professional associations that need speakers NOW. => How to average $1,000 in sales per attendee at your live events. => How Michael can further help you earn $250,000 per year from just two marketing strategies. Register even if you can’t make it live so you can get the recording. If you’re using speaking to market your coaching – or you want to – don’t miss out on this full-of-content free training. Michael averages 80 new clients per year just from speaking TWO times per month for free to small audiences of 30 people. That’s about $200,000 in business from the exact strategy he’ll teach you on the call. 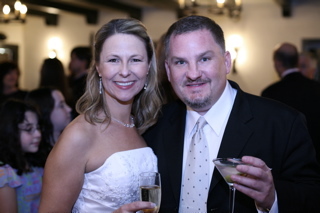 Here’s a picture of Michael and me at my wedding almost 5 years ago. Michael is a fun and funny guy, so in addition to learning a ton on this call, we’re also going to have a very good time. I really hope you can join us!